Are you looking for ways to improve your campaign health? You should order these 1.87x2.12 personalized apple shape magnets - outdoor & car magnets 30 Mil right ways. These custom shaped outdoor magnets will make your brand information clearly visible from over the car door or car bumper. 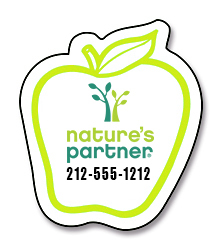 You can employ these custom fruit shaped magnets to spread healthcare awareness, promote your produce stand, nutrition program or raise awareness about healthy eating. You can take advantage of our free full color printing and free digital design assistance to make your brand information stand out over these personalized magnets. Request a quote to know price cuts that you can avail for wholesale 1.87x2.12 personalized apple shape magnets - outdoor & car magnets 30 Mil.